In just seven days, so many exciting things have happened! My sister-in-law moved to San Francisco to start graduate school, my husband finally returned from his week long business trip in Texas, and I taught myself to sew a few decorative pillows! One of the most exciting things that has happened this week, though, is the opportunity I was given to contribute a guest post on one of my favorite blogs, More Than a Mount Full, by the talented and terrific Chef Dennis Littley. If you’re in the dark about Dennis, let me educate you: He is an executive chef who heads a culinary program at Mount St. Joseph’s Academy, a girls’ school in Pennsylvania. His blog is a culmination of his 35 years of cooking experience, and he tells magnificent stories with his photography and food. Not only is he supportive and attentive of his readers, but he is an invaluable source of culinary know-how for all home cooks, including myself. My post on Dennis’s blog, featuring this scrumptious, simple milk chocolate soufflé (recipe included below), is now up and running at this link. I would love it if you could take a look and share your thoughts with me! Lovely souffle’! Thought I would come check you out from Chef Dennis’ guest post!!! Great job! and Love your Bread pudding recipe from earlier. I have bookmarked it! Discovered your gorgeous blog from your guest post at More than a Mount Full. Just stopped by to say how much enjoyed your post there. So nice to find you, Georgia! I’m definitely trying your delectable recipe! Thank you (and Dennis)! Great post, Georgia!! The souffle looks incredible! Better than I’ve seen in some restaurants. I came over from your guest blog. A great post and great pictures. Thanks for sharing. I’ve never had souffle! I must try this! what a great job with that amazing souffle! Thanks for such a wonderful guest post, it hit 99 on FB really quickly! It’s got top 9 written all over it!! ChefD and his gals are definitely the stars in the food blogsphere! Your souffle looks to die for! I’ve never made a souffle… this looks absolutely beautiful and delicious Georgia. These look GORGEOUS! Your pictures are beautiful and the recipe looks incredible. Thank you for sharing! What a beauty of a dessert. Kudos on the guest post. Dennis’s blog is a great one. I want to say thanks to you for the support and well wishes for my sister and her family. It’s meant a lot to them. Just like Dennis said, this will definitely be a Top 9! Great guest post and I love the pics! of course Chef D sent me over here, so glad he did! your photos are magnificent, and I am cheering you on for a Top 9!!! I’m in love with this souffle – it looks fantastic! Georgia: These are mini-chocolate decadence. I like that the recipe yields for two. They look too perfect and pretty to cut into, but I would anyways. :) Beautifully done! What a great recipe…simple ingredients and ooey-gooey chocolate!! I love recipes that let me use my ramekins, too!!! Isn’t Chef Dennis great? I’m so glad that you were able to do a guest post for him. Two of my favorite bloggers in one place! I’ve never made souffle’s before, so I’m glad I get to drool over yours! Thank you for sharing, sweet woman! Congrats on the guest post and on Top 9! Being quite new on Foodbuzz, I find Chef Dennis a source of inspiration and enlightenment, sometimes more valuable in introducing people and new blogs than Foodbuzz :)). I was thrilled to see you on Chef Dennis’s blog. Congratulations! How wonderful to guest post with Chef Dennis! I just adore him! Your souffles look Heavenly and I cannot wait to try them! I just made David Lebovitz’s Goat Cheese Souffles and they turned out divine. Chocolate is next on my list thanks to you! Just came from Chef Dennis’ blog. I love your post. 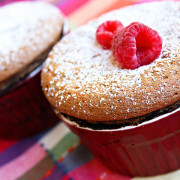 This souffle looks so delicious and simple to make, and I’ve been wanting to try my hand at a sweet souffle for forever! Thanks for sharing! following you now, don’t want to miss any of your delicious posts! Sounds like an awesome and exciting week! I hope this upcoming week is equally fantastic :) Loved your post on Chef Dennis’ blog and these chocolate souffles! Oh… my… gosh! So… Yummy!!! Great job on the guest post, Georgia! These souffles look just delicious! I always order chocolate soufflé for dessert when it is offered in a restaurant (which is pretty rare) so I think I’ll just make my own. I like the idea of a milk chocolate one like you have. I’ve been eating so much dark chocolate lately until a friend gave me some milk chocolate with hazelnuts, made in Sweden, and realized I really like good milk chocolate too. Thanks for the recipe. I read this article completely on the topic of the resemblance of hottest and earlier technologies, it’s amazing article. regarding this article. I wish to learn more things approximately it! in the break of day, for the reason that i enjoy to find out more and more. think we could greatly benefit from each other. If you’re interested feel free to send me an e-mail. comment and let mme know if this is happening tto them as well? Wonderful website. A lot of useful info here. I’m sending it to a few friends ans also sharing in delicious. And naturally, thanks for your sweat!